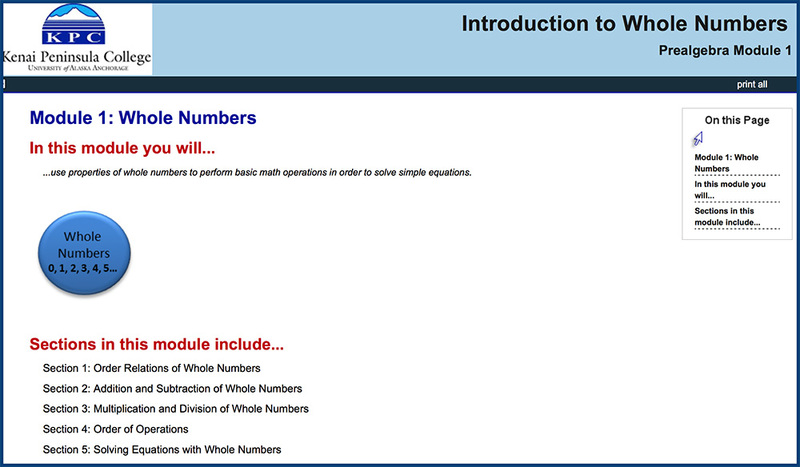 Pre-Algebra is part of the Essential Pre-College Math (EPM) series of 16 self-paced, online modules that cover topics ranging from basic number properties to factoring and graphing polynomials. 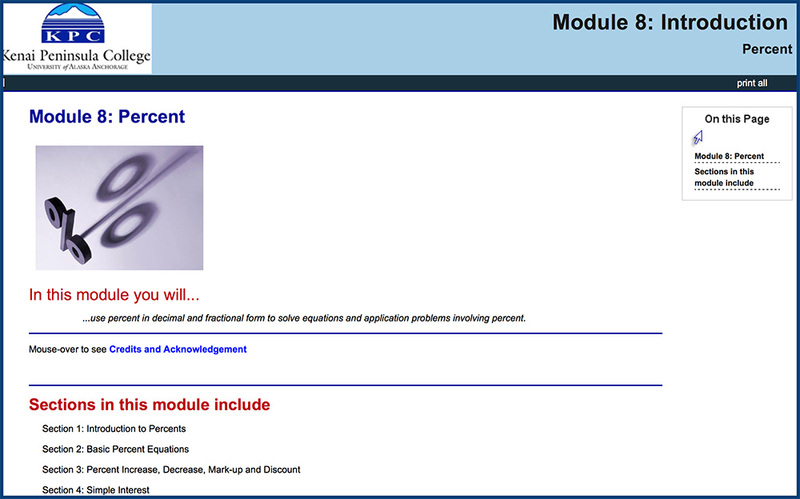 The modules are designed to help students review or master content usually covered in Pre-Algebra and Algebra I courses taught in high school, while at the same time presenting the material with authentic examples illustrating how mathematics is used in the various fields of study related to work for architectural engineering technicians or construction. This course underwent a thorough review by subject matter experts. 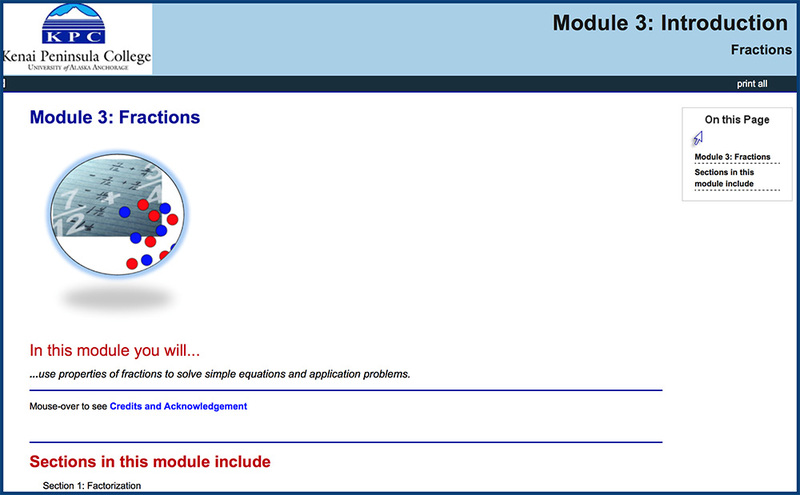 Pre-Algebra Module 1: Whole Numbers includes: Pre-Assessment Module 1 Preassessment Introduction to Whole Numbers Section 1: Order Relations of Whole Numbers Section 2: Addition and Subtraction of Whole Numbers Section 3: Multiplication and Division of Whole Numbers Section 4: Order of Operations Section 5: Solve Equations with Whole Numbers Post-Assessment. 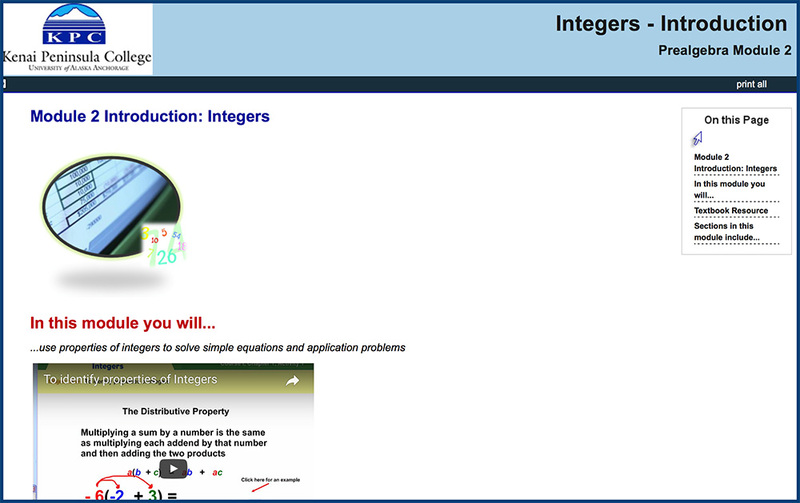 Students will use properties of integers to solve simple equations and application problems. Includes: Pre-Assessment Integers – Introduction Section 1: Integers and the Number Line Section 2: Operations with Integers Section 3: Order of Operations with Integers Section 4: Solving Linear One Variable Equations Post-Assessment. Pre-Algebra Module 3: Fractions Students will use properties of fractions to solve simple equations and application problems. Module includes: Pre-Assessment Module 3: Introduction Section 1: Factorization Section 2: Fraction Notation Section 3: Fractions Involving Variables Section 4: Multiplication and Division of Fractions Section 5: Solving Equations Involving Multiplication and Division of Fractions Post-Assessment. 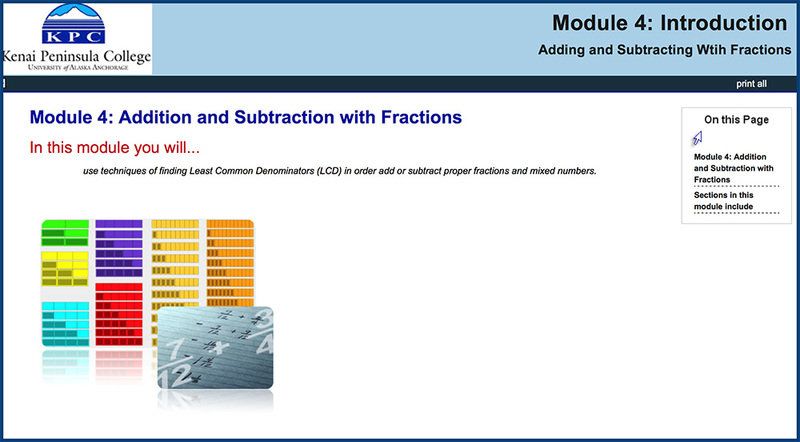 Pre-Algebra Module 4: Addition and Subtraction with Fractions. Learning Objective: Students will use techniques of finding Least Common Denominators (LCD) in order to add or subtract proper fractions and mixed numbers. Module includes: Pre-Assessment, Module 4: Introduction, Section 1: Adding and Subtracting Fractions, Section 2: Fractions and Order of Operations, Section 3: Equations Involving Fractions, and Post-Assessment. 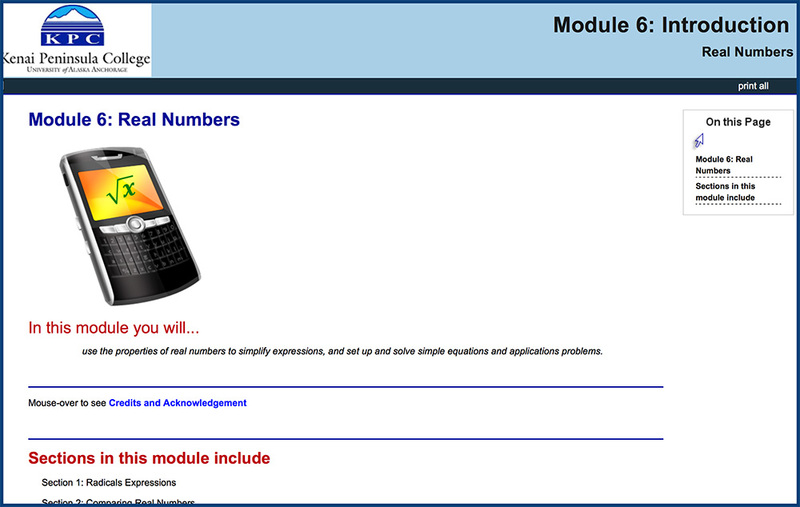 Pre-Algebra Module 5: Decimal Numbers. Learning Objective: Students will use place values and powers of 10 to set up and solve simple equations and applications using decimals. 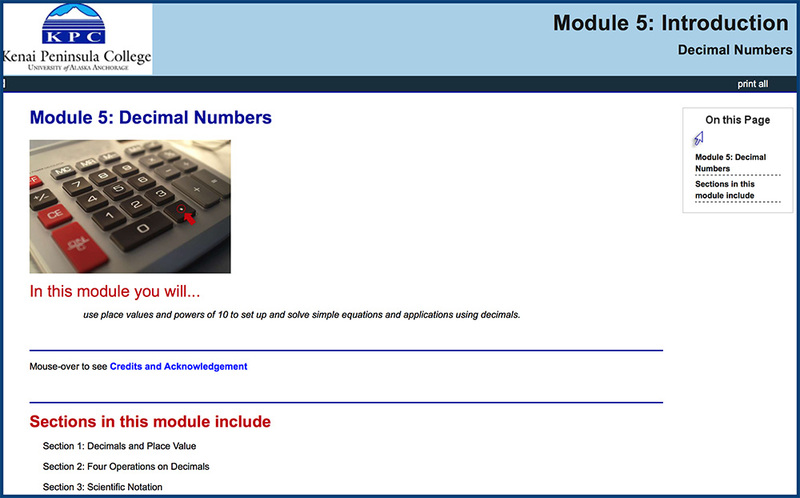 Module includes: Pre-Assessment, Module 5: Introduction, Section 1: Decimals and Place Value, Section 2: Basic Arithmetic Operations with Decimals, Section 3: Scientific Notation, Section 4: Solving Linear Equations, and Post-Assessment. Pre-Algebra Module 6: Real Numbers includes: Pre-Assessment, Module 6: Introduction, Section 1: Radical Expressions, Section 2: Comparing Real Numbers, Section 3: Properties of Real Numbers, Section 4: Polynomials in Multi-Variables, Post-Assessment. 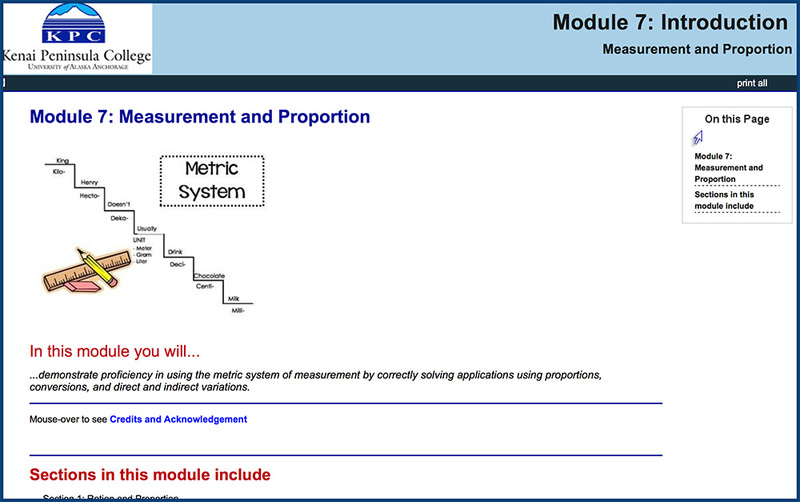 Pre-Algebra Module 7: Measurement and Proportion includes: Pre-Assessment, Module 7: Introduction, Section 1: Ratios and Proportion, Section 2: English Standard System of Measurement, Section 3: Metric System of Measurement, Section 4: Converting Measurements Between Systems of Measurement, Section 5: Variation, Post-Assessment. Pre-Algebra Module 8: Percent includes: Pre-Assessment, Module 8: Introduction, Section 1: Introduction to Percents, Section 2: Basic Percent Equations, Section 3: Percent Increase, Decrease, Mark-up, and Discount, Section 4: Simple Interest, Post-Assessment.